Name of several high priests at the time of the Second Temple. The sequence given them below is based on the statements of Josephus, which are unreliable, since Josephus did not have access to trustworthy sources. Son of the Jaddua mentioned in Neh. xii. 11, according to Josephus ("Ant." xi. 8, § 7); this Jaddua is said to have been a contemporary of Alexander the Great, but I Macc. xii. 7, 8, 20 regards Onias as a contemporary of the Spartan king Areus (309-265 B.C.). Yet it is doubtful whether Onias I. is meant, for the entire correspondence and the treaty with the Spartans are probably fictitious. The Simon (I.) the Just extolled in Ecclus. (Sirach) 1. 1 and in legend (according to the Hebrew text the son of Jonathan, but according to the Greek text the son of Onias) was probably the son of Onias I. Many scholars take Simon the Just to be the second of that name, in which case a later date must be assigned to his son Onias II. Son of Simon the Just. He was still a minor when his father died, so that his uncle Eleazar, and after him the latter's uncle Manasseh, officiated as high priests before he himself succeeded to that dignity (Josephus, "Ant." xii. 4, § 1). According to Josephus, he was a covetous man and of limited intelligence, whose refusal to pay the twenty talents of silver which every high priest was required to pay to the King of Egypt threatened to imperil both the high priest and the people; but at this juncture Joseph, the clever son of Tobias and nephew of Onias, succeeded in pacifying King Ptolemy III. (Euergetes). Onias is said (ib. § 10) to have died, almost simultaneously with his nephew Joseph, during the reign of Seleucus Soter, hence about 181 B.C. His successor in office was his son Simon II. Son of Simon II. He is described as a pious man who, unlike the Hellenizers, fought for Judaism (II Macc. iii.-iv.). Seleucus Philopator defrayed all the expenses connected with the sanctuary and was friendly to the Jews. A traitorous official of the Temple, however, Simon the Benjamite, induced the king to undertake the plunder of the Temple treasury (see Heliodorus); the attempt was not successful, and the Syrian court never forgave the high priest for its miscarriage. When Antiochus IV. (Epiphanes) became king, Onias was obliged to yield to his own brother Jason (II Macc. iv. 7). According to Josephus ("Ant." xii. 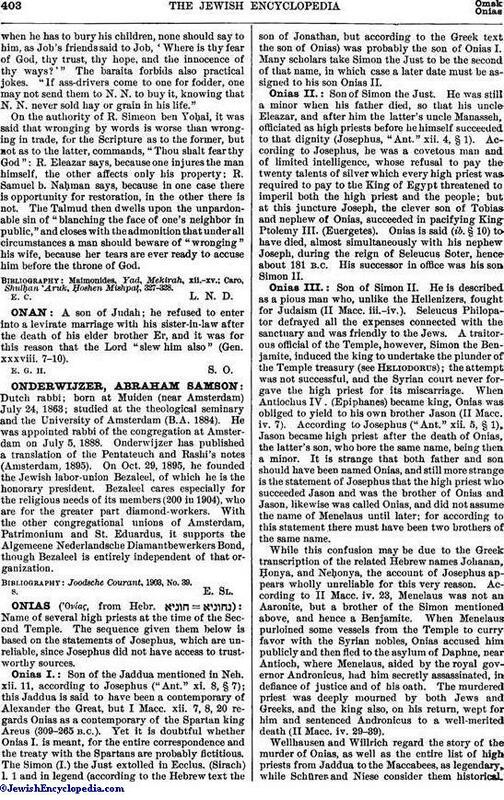 5, § 1), Jason became high priest after the death of Onias, the latter's son, who bore the same name, being then a minor. 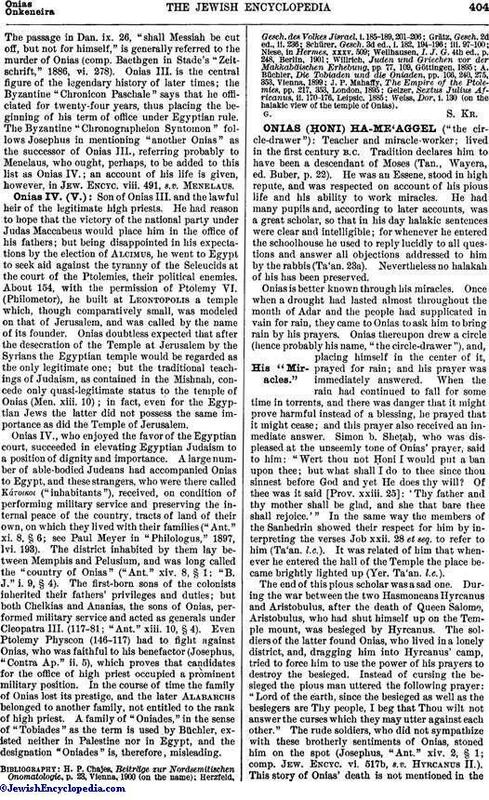 It is strange that both father and son should have been named Onias, and still more strange is the statement of Josephus that the high priest who succeeded Jason and was the brother of Onias and Jason, likewise was called Onias, and did not assume the name of Menelaus until later; for according to this statement there must have been two brothers of the same name. While this confusion may be due to the Greek transcription of the related Hebrew names Johanan, Ḥonya, and Neḥonya, the account of Josephus appears wholly unreliable for this very reason. According to II Macc. iv. 23, Menelaus was not an Aaronite, but a brother of the Simon mentioned above, and hence a Benjamite. When Menelaus purloined some vessels from the Temple to curry favor with the Syrian nobles, Onias accused him publicly and then fled to the asylum of Daphne, near Antioch, where Menelaus, aided by the royal governor Andronicus, had him secretly assassinated, in defiance of justice and of his oath. The murdered priest was deeply mourned by both Jews and Greeks, and the king also, on his return, wept for him and sentenced Andronicus to a well-merited death (II Macc. iv. 29-39). Wellhausen and Willrich regard the story of the murder of Onias, as well as the entire list of high priests from Jaddua to the Maccabees, as legendary, while Schürer and Niese consider them historical.The passage in Dan. ix. 26, "shall Messiah be cut off, but not for himself," is generally referred to the murder of Onias (comp. Baethgen in Stade's "Zeitschrift," 1886, vi. 278). Onias III. is the central figure of the legendary history of later times; the Byzantine "Chronicon Paschale" says that he officiated for twenty-four years, thus placing the beginning of his term of office under Egyptian rule. The Byzantine "Chronographeion Syntomon" follows Josephus in mentioning "another Onias" as the successor of Onias III., referring probably to Menelaus, who ought, perhaps, to be added to this list as Onias IV. ; an account of his life is given, however, in Jew. Encyc. viii. 491, s.v. Menelaus. Son of Onias III. and the lawful heir of the legitimate high priests. He had reason to hope that the victory of the national party under Judas Maccabeus would place him in the office of his fathers; but being disappointed in his expectations by the election of Alcimus, he went to Egypt to seek aid against the tyranny of the Seleucids at the court of the Ptolemies, their political enemies. About 154, with the permission of Ptolemy VI. (Philometor), he built at Leontopolis a temple which, though comparatively small, was modeled on that of Jerusalem, and was called by the name of its founder. Onias doubtless expected that after the desecration of the Temple at Jerusalem by the Syrians the Egyptian temple would be regarded as the only legitimate one; but the traditional teachings of Judaism, as contained in the Mishnah, concede only quasi-legitimate status to the temple of Onias (Men. xiii. 10); in fact, even for the Egyptian Jews the latter did not possess the same importance as did the Temple of Jerusalem. Onias IV., who enjoyed the favor of the Egyptian court, succeeded in elevating Egyptian Judaism to a position of dignity and importance. A large number of able-bodied Judeans had accompanied Onias to Egypt, and these strangers, who were there called Κάτοικοι ("inhabitants"), received, on condition of performing military service and preserving the internal peace of the country, tracts of land of their own, on which they lived with their families ("Ant." xi. 8, § 6; see Paul Meyer in "Philologus," 1897, lvi. 193). The district inhabited by them lay between Memphis and Pelusium, and was long called the "country of Onias" ("Ant." xiv. 8, § 1; "B. J." i. 9, § 4). The first-born sons of the colonists inherited their fathers' privileges and duties; but both Chelkias and Ananias, the sons of Onias, performed military service and acted as generals under Cleopatra III. (117-81; "Ant." xiii. 10, § 4). Even Ptolemy Physcon (146-117) had to fight against Onias, who was faithful to his benefactor (Josephus, "Contra Ap." ii. 5), which proves that candidates for the office of high priest occupied a prominent military position. In the course of time the family of Onias lost its prestige, and the later Alabarchs belonged to another family, not entitled to the rank of high priest. A family of "Oniades," in the sense of "Tobiades," as the term is used by Büchler, existed neither in Palestine nor in Egypt, and the designation "Oniades" is, therefore, misleading. Weiss, Dor, i. 130 (on the halakic view of the temple of Onias).